Cosmetic dentistry encompasses all of the dental treatments that have the goal of improving the appearance of a person’s teeth, lips, and gums – and the overall smile aspect. The aesthetic improvements of cosmetic dentistry by the dentist at Woodbury Dental and Laser Clinic can sometimes be in combination with improvements in the function of the teeth, lips, and the gums – resulting to improved overall dental health. Cosmetic dentistry by the dentist at Woodbury Dental and Laser Clinic can bring results that can change a person’s life – not only on the outside, but inside as well. Improvements that are done to make a person’s smile more attractive can have a huge impact on how that person feels on the inside as well; the confidence boost and the overall feeling of satisfaction can have significantly positive effects on how one sees himself/herself, and others as well. Cosmetic dentistry treatments can also provide improvements in the function of the teeth, lips, and gums areas – improving overall dental health. For example – orthodontics treatments that make teeth look straighter can improve the appearance of the smile – but these treatments can also ensure that teeth are positioned in such a way that it is easier to maintain their cleanliness, and that the jaws do not suffer from the bad effects of misaligned teeth. Teeth Whitening – Teeth whitening treatments are used to address concerns with teeth that have unsightly stains, or discolourations. Several factors affect the stains or discolourations on the surface of teeth, such as: excessive consumption of dark-coloured beverages (coffee, tea, red wine); tooth decay; the use of tobacco products or smoking; and the natural ageing process. Teeth whitening cosmetic dentistry by the dentist at Woodbury Dental and Laser Clinic can bring back the natural whiteness of teeth by eliminating the unattractive stains and discolourations. Teeth Straightening – Crooked or misaligned teeth can negatively affect the appearance of an otherwise good-looking smile; teeth that are not properly aligned can also affect the way the jaws work, and can wear down the teeth enamel prematurely. Teeth straightening by a dentist in Kent, through orthodontics or Invisalign clear braces, effectively move teeth into a properly aligned position – improving both the form and function of a person’s smile. White Fillings – White dental fillings, or those that are tooth-coloured, are used to fill cavities caused by tooth decay. White fillings are more aesthetically pleasing compared to silver or amalgam fillings, which are dark in colour; the tooth-coloured fillings are barely noticeable when a person smiles, making it possible to deal with cavities or tooth decay without unsightly dark tooth fillings. 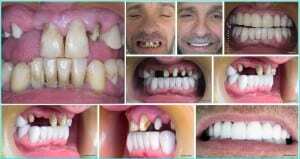 Dental Crowns and Bridges – Dental crowns and bridges are tooth restorations that are used to address the problems caused by missing teeth. A dental crown or a dental bridge replaces the form and function of teeth that have been lost, providing a person with an attractive smile without missing teeth once more. Woodbury Dental and Laser Clinic Kent dentists use all-porcelain dental crowns, and porcelain fused to gold dental crowns that exactly match the appearance of the patient’s natural teeth. Dental Implants – Dental implants replace the form and function of missing teeth; the implants themselves are artificial tooth roots that are embedded directly onto the jaw bone, and are connected to tooth restorations (such as dental crowns or dental bridges). The problem of missing teeth affect the overall form and function of one’s dental health – and dental implants can effectively address these issues. Dental Veneers – Dental veneers by the dentist at Woodbury Dental and Laser Clinic are porcelain laminates that are bonded to the affected teeth (or tooth) using a special cement. Dental veneers address a number of cosmetic dentistry problems, including: cracks, chips, discolourations, and gaps or spaces in between teeth; the veneers are used to improve the tooth’s color, shape, and size, resulting to more attractive smiles. Gum Contouring – Gum contouring is used in cases when the gums need to be reshaped or re-contoured, to create a smile that is more attractive. Gummy smiles (when the gums look bigger, and the teeth look abnormally small) are addressed using gum contouring procedures to change the shape and size of the gums. Lip Enhancements – Lip enhancements provide improvements on the lips that frame the teeth, so that the overall smile is presented in an attractive and youthful-looking package. Lip enhancements may include treatments to make the lips fuller, thinner, or more evenly-shaped. Smile Makeovers – Smile makeovers involve more than one cosmetic dentistry procedure by the dentist at Woodbury Dental and Laser Clinic. The procedures or treatments are done to provide an overall improvement in the appearance of the smile. A smile makeover can include the placement of dental implants, lip enhancement procedures, teeth whitening, teeth straightening or orthodontics – and can even include a smile-lift of a face-lift.